Objective: The level of awareness of patients receiving supportive periodontal therapy (SPT) concerning the role of smoking as a risk factor for oral health was investigated. Materials and Methods: A questionnaire was administered to 158 patients previously treated for periodontitis in four periodontally oriented private dental offices in Rome. The generalized linear model was used to test the simultaneous effect of questions posed to all patients. Fisher's exact test was used to verify significant associations among qualitative variables. Results: Only 53.79% of the total sample referred having been informed by the dentist/hygienist about smoking as an oral health risk factor. About 40% of patients did not know that oral cancer exists and only 36.08% of them reported being informed about it by their own dentist/hygienist. 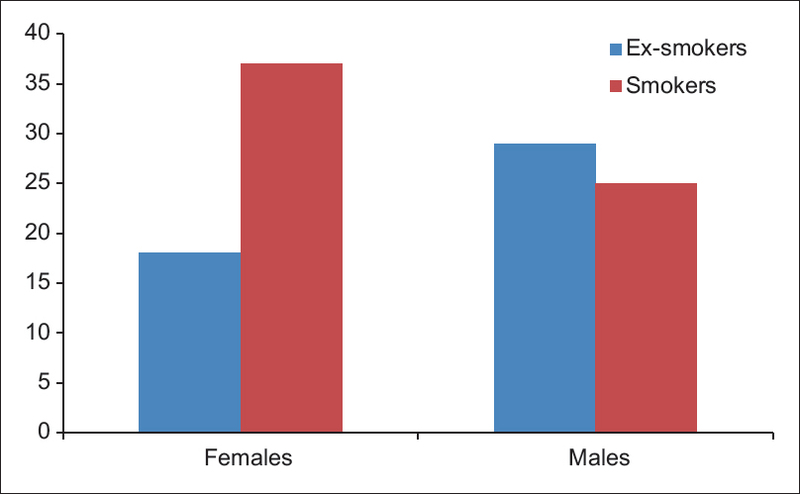 Females are significantly less frequent among ex-smokers than among smokers. Nonsmokers were on periodontal supportive therapy for a longer period than smokers. Patients who started smoking later found harder to quit smoking than those who started earlier. Conclusion: Awareness of patients in SPT about health risks related to smoking does not assume a change in their harmful behavior. 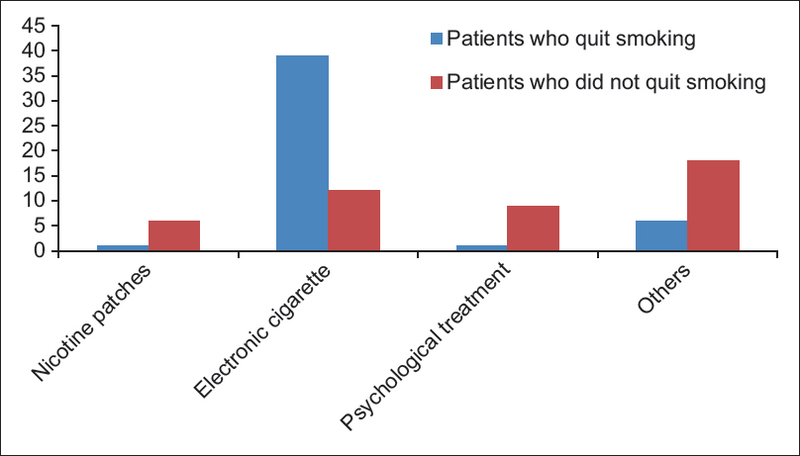 Among oral health professionals, there is not yet a widespread awareness of the importance of their role in increasing patient's motivation to quit. Tobacco smoking is the main risk factor for many chronic degenerative diseases, particularly for respiratory and cardiovascular systems. Several adverse effects occur in the mouth as well: periodontal disease, tooth decay, peri-implantitis, tooth discoloration, precancerous lesions, and oral cancer.,,,, Many studies have shown that dental experts do not always adequately promote smoking cessation to their patients although it is known that attempts to quit under health-care guidance have higher success rates. A 2004 Norwegian  study, conducted through a questionnaire sent to 1500 dentists and 522 dental hygienists, showed that hygienists talk to patients about smoking status an average of 18 min/week and dentists 13 min/week. Moreover, in 2000, a UK survey showed that many dentists believed that the entire dental team should take more action in encouraging patients to quit smoking and they were very willing to implement tobacco cessation strategies. Since smokers are rarely aware of the harmful effects that smoking has on the oral cavity, the entire dental team and specifically the dental hygienist play a key role in informing and discussing with patients smoking habit consequences on oral health and in promoting tobacco cessation activities. The main aim of the present study was to investigate the level of awareness of patients receiving supportive periodontal therapy (SPT) concerning the role of smoking as a risk factor for oral health. The secondary aim of this study was to analyze the relationship between oral health, lifestyles, awareness of tobacco smoking risks, and probability of being smokers. The choice to include only patients treated for periodontitis in the present survey was related to the existing correlation between smoking and periodontitis, hence the assumption that these patients had previously been informed about the harmful effects of smoking tobacco by oral health professionals. The present study involved the collection and statistical processing of data from a “face-to-face” questionnaire, provided by one of the authors (VM) to each patient, administered over a 4-month period to 158 patients, previously treated for periodontitis in four periodontally oriented private dental offices in Rome. A semi-structured questionnaire was specifically designed for the study and was previously administered to a group of 20 patients with features similar to those of the sample that was to be interviewed to identify and correct possible interpretation errors, superfluous or missing questions, confused or inappropriate answer modalities. The questionnaire included three sections. In the first section, information about the aim of the study as well as data protection and confidentiality was provided to the patients. The informed consent sheet was also enclosed for the use of personal sensitive data for research purposes, in an aggregated and anonymous form. The study did not imply drug administration or diagnostic/therapeutic treatments but was only aimed at the administration of a knowledge questionnaire. In all stage of the study, the ethical guidelines of the 1975 Helsinki Declaration were followed. The second section involved the collection of personal data and information about the status of smoker, ex-smoker, or nonsmoker. The third section [Table 1] included one open question and 36 closed questions, 16 of which were dichotomous requesting a single yes or no answer and 20 of which were polytomic requiring a single answer among three or more options. Some questions were administered only to smokers and some only to drinkers. An open question was included among five of the dichotomous questions to allow more free and spontaneous answers. As a first step, questions posed to all patients (smokers, ex-smokers, and nonsmokers) were treated as statistical variables. The question “Do you or did you smoke?” was treated as the dependent variable with three qualitative levels corresponding to the following possible answers: (A) “I am a smoker;” (B) “I have never smoked;” (C) “I am an ex-smoker.” To test the simultaneous effect of multiple explanatory variables on a single-dependent variable which should be explained, the generalized linear model (GLM), with a multinomial distribution of the dependent variable and the “log it link function,” was used. The following items or questions were used as qualitative explanatory variables: gender (male/female); “Did your dentist/hygienist ever talk to you about the harmful effects of smoking on oral health?”(yes/no); “Do you know that oral cancer exists?”(yes/no); “Did your dentist/hygienist ever talk to you about oral cancer?”(yes/no); “Have you ever had cancer?”(yes/no); “Have any of your family members or relatives ever been affected by cancer?”(yes/no); “Have you ever been diagnosed with oral mucosal disorders?”(yes/no); “Are you presently wearing removable dentures?”(yes/no); “Have you ever been diagnosed with human papillomavirus infections?”(yes/no); “Have you ever been diagnosed with diabetes mellitus?”(yes/no); “Have you ever been diagnosed with a cardiovascular disease?”(yes/no); “Have any of your family members been diagnosed with diabetes mellitus or any cardiovascular diseases?”(yes/no); “Are you presently taking any medication?”(yes/no); “Do you use mouthwash regularly?”(yes/no). Finally, the following questions were used as quantitative variables: “Do you drink alcoholic beverages regularly? If yes, which one?” (0–6 score); “How many times a day do you usually brush your teeth?” (0–4 score); “How many fruit/vegetable portions do you usually eat per day?” (1-4 score); “How many fruit/vegetable portions do you usually eat per week?” (1–4 score); “How many times a week do you usually play sports activities for at least 20–30 min?” (1–4 score); “How long have you been on supportive periodontal therapy?” (1–4 score). To statistically analyze questions asked only to smokers and ex-smokers, two qualitative-dependent variables were identified: “Have you ever thought of quitting smoking?”(yes/no); “Have you ever tried to quit smoking?” (yes, I did; yes, but I started smoking again; no, I have not). Moreover, four explanatory variables were considered: “How many cigarettes a day do you or did you usually smoke?” (A = <10; B = at least 10 but <20; C = at least 20); “At what age did you start smoking?” (A = before 15 years of age; B = after 15 years of age and before 35 years of age; C = after 35 years of age); “Are/were you the only smoker in your family?” (yes/no); “What kind of supportive device did you use to quit smoking?” (A = nicotine patches; B = electronic cigarettes; C = psychological support; D = others; E = none). Since the two dependent variables had a somewhat unusual distribution due to a disproportionately low number of patients had neither thought of nor attempted to quit smoking, a nonparametric statistical test was preferably used to analyze the association between the latter and the explanatory variables since it does not imply any assumption about the distribution of the considered variables. In particular, Fisher's exact test was used since it is particularly appropriate in verifying the presence of statistically significant associations among qualitative variables. Since the same variables were used in multiple tests, Bonferroni correction was finally applied to exclude the possibility that a significant result may have originated only by effect of chance. All descriptive results are reported in [Table 2] and [Table 3]. The sample gender was homogeneous (female/male = 79/79 = 1) and ranged between 24 and 86 years of age (mean age = 54.23 ± 1.057). All smokers and ex-smokers only smoked cigarettes (109 individuals). None smoked or used to smoke pipes, cigars, or smokeless tobacco. All of these patients smoked or used to smoke more than 10 cigarettes a day, and 68.81% of them started smoking between the ages of 15 and 35 years. Eighty-six percent of this subsample thought about quitting, especially due to general health problems, awareness of the risks of smoking, or economic reasons, and in 79% of them, other family members are smokers. Only 53.80% of the total sample referred having been informed by the dentist/hygienist about smoking as an oral health risk factor. About 40% of patients did not know that oral cancer even existed, and only 36.08% of them reported being informed about it by their own dentist/hygienist. About 8% (13) of patients were affected by cardiovascular diseases and 3.80% (6) by diabetes mellitus. Two of these patients were affected by both cardiovascular diseases and diabetes. About 88% of patients had never been affected by cancer; however, 47.47% had at least one family member affected by cancer, especially lung cancer (39.47%). Sixty patients (37.97%) referred having been affected by oral mucosal alterations and 41.77% usually take medications. Only 10.13% of the sample has been affected by human papillomavirus (HPV)-related diseases, especially vulgar warts, and the majority of patients (90%) had never been vaccinated for HPV. None of the HPV-infected patients had been previously vaccinated against HPV although two of them did not respond. About 52% of patients brush their teeth twice a day, and 41.14% of them use alcohol-free mouthwashes. Twenty-six patients (16.46%) wear at least one partial or total removable denture, and 88 patients (55.70%) were on SPT for >2 years. About 45% of patients declared that they usually consume two servings of fruit and/or vegetables a day and 47.47% of them consume more than nine servings of these products each week. About 37% of patients do not play sports activities at all, and 50% of them do not drink alcoholic beverages. The most frequently used alcoholic beverage was wine, mainly during meals and in moderate amounts. GLM results allow pointing out some statistically significant effects (P < 0.05). Female patients are significantly less frequent among ex-smokers (C level) than among smokers [estimate = −0.49; standard error (SE) =0.24; P = 0.039; [Figure 1] and [Table 3]. Smokers and ex-smokers do not significantly differ as far as awareness of smoking risk on oral health is concerned. Moreover, ex-smokers usually drink less alcohol beverages and brush their teeth more frequently than smokers, although these trends nearly reach statistical significance (respectively, P = 0.063 and P = 0.097). Nonsmokers (B level) have a significantly lower probability to answer “yes” to the question “Did your dentist/hygienist ever talk to you about the harmful effects of smoking on oral health?” [estimate = −1.24; SE = 0.38; P = 0.001; [Figure 2] and [Table 4]. Moreover, nonsmokers were on periodontal supportive therapy (PST) for a longer period than the smokers [estimate = 0.53; SE = 0.25; P = 0.032; [Table 3]. Since the ratio between the model deviance (D) and the number of freedom degrees (df) is very close to 1 (D: df = 1.089), the model seems to be quite adequate and the significant explanatory variables allow to predict the frequency of ex-smokers and nonsmokers compared to smokers reasonably well. The variable “Did you ever think of quitting smoking” is not statistically associated to all the considered explanatory variables although a marginal significance (P = 0.066) is present for the variable “How many cigarettes a day do you usually smoke or did you?” In particular, the emerged trend indicates that a greater number of patients thought of quitting smoking among those who smoked the greater number of cigarettes a day (B and C levels) compared with those who smoked less (level A): the variable “Have you ever tried to quit smoking?” is significantly affected by the variable “What kind of supportive device did you use to quit smoking?” In particular, among patients who quit smoking, a significantly greater number used electronic cigarettes (e-cigarettes) as a supportive device [P = 0.002; [Figure 3]. Moreover, a nearly significant association is present as far as the age of smoking onset is concerned (P = 0.055), that is, patients who started smoking later (C level) found harder to quit smoking than those who had started earlier (A and B levels). All other relationships were not significant. Since four tests were performed using the same variable (K = 4), Bonferroni correction was performed to adjust the significance level (α = 0.05). Nevertheless, all results were statistically significant (P = 0.0021<α/K). The present data are in line with the smoking behavior in Italy which was recently reported by the Italian Institute of Health (ISS) Doxa survey for the years 2013–2014, with particular reference to other types of smoking habits other than cigarette smoking (2.1% smoked cigars, 2.1% smoked cigarillos, and 0.2% smoked pipes). To the best of our knowledge, no comprehensive data exist for the use of smokeless tobacco in Italy, but it is certainly extremely low.,, The first most outstanding finding in the present study was that women were more frequent among smokers than among ex-smokers and this supports the results reported by the GfK Eurisko survey performed on over 1500 adult patients on behalf of Women against Lung Cancer in Europe Association. This study reported that despite a significant decline in smoking rates in Italy over the last 15 years (from 31% in 1998 to 21% in 2013), the number of female smokers increased compared to male smokers and women quit smoking less frequently (6%) than men (13%). Furthermore, the recent 2014 ISS Doxa report showed that in Italy, the number of smokers decreased by 0.8% in males and increased by 3.6% in females from 2013 to 2014. As part of the “No smoking, be happy” project, the Umberto Veronesi Foundation and Pfizer recently investigated, with an online survey, why it is so difficult for women to quit smoking. They found that women do not give up smoking because it is the only way they have to relax. None of the patients in the present study used smokeless tobacco. This is in line with the fact that this kind of tobacco use is not popular in Italy, whereas it is widely used in the USA and in Northern Europe. Our findings on age of smoking-onset support those documented in the ISS Annual Report on smoking  which reported 17 years of age as the age of smoking onset for men and 18 years of age for women. Moreover, as much as 29.83% of men and 22.22% of women started smoking before 15 years of age and these percentages are higher than those reported by the 2014 ISS survey, respectively, 17.2% for men and 18.2% for women, and have an inverted ratio since men started before 15 years of age more frequently than women. However, these data are likely biased by the small sample. To the best of authors' knowledge, in the international literature, there are no data describing the difficulties of quitting smoking in relation to the onset age of smoking. In the present study, patients who started smoking after 35 years of age quit smoking with more difficulty than those which had started before. A possible explanation for this may be that patients who started smoking later were already aware of the health risks while those who started smoking at a younger age were not, and therefore, they are more likely to be able to quit when they do become aware. It should also be considered that the decision to quit smoking, thus developing a motivation to change, requires a certain level of maturity which adolescents have not yet acquired. Since only 43.12% of patients who tried to quit smoking are presently nonsmokers, it seems that the awareness of the harmful consequences of smoking less frequently motivates smokers to quit smoking permanently. Priority, will, and trust in the smoker's own ability to produce any behavioral change are the essential elements in motivating the change, but they should also be maintained and reinforced over time to guarantee permanent smoking cessation. The present statistical analysis does not provide any evidence, indicating that the awareness of oral health smoking-related risks induces patients to quit smoking. Actually, contrary to our expectations, and to most international data,,, smokers were more aware about the smoking/oral health relationship than nonsmokers, having answered “yes” to the question “Did your dentist/hygienist ever talk to you about the harmful effects of smoking on oral health?” with a significantly greater frequency than nonsmokers. The most plausible interpretation of this result is that dentists and hygienists probably informed patients after having verified that they were smokers. Another possible interpretation is that patients' awareness of smoking risks increases the probability that they smoke, possibly due to their inclination to risky lifestyles and behaviors. The majority of the present patient sample (53.80%) was informed about the risks of smoking on oral health by oral health professionals, and this is in line with the behavior described in international literature as far as hygienists are concerned. For example, in England, where the percentage of hygienists who asked patients if they were smokers increased from 30% in 1996 to 89% in 2007, however, only slightly more than half of them helped patients to quit smoking, as already found in the study of Villa et al., in which 69.1% of smokers did not receive counseling from dentists to help them quit smoking. On the other hand, a recent systematic review by Ramseier and Suvan  found that counseling for tobacco cessation provided by dental professionals was very effective. Nevertheless, in the present study, patients were not asked any specific questions about the relationship between smoking and oral cancer, so patients' awareness of smoking as a risk factor for oral cancer may only, although strongly, be supposed. However, studies in which this issue was specifically investigated have been conducted and a low grade of knowledge was found in a high percentage of patients (89.4%) while a low percentage of patients (15.9%) was aware about the strong predisposing role of smoking in oral cancer occurrence. In the present study, gender was not significantly related to the patients' knowledge of oral cancer although significantly greater knowledge was previously found among men compared to women. A 2003 Scottish study also found that only 19% of dentists routinely asked patients about their smoking habits and that a further 49% do so occasionally. In this regard, the 2014 ISS Doxa survey  reported that only 14.2% of the patients referred being advised to quit smoking by the dentist as opposed to 42.5% who were not. It is worth noting that as much as 43.2% of the sample had not undergone dental examinations during the previous 12 months. Since the results of the present study point out that the majority of patients used e-cigarettes to quit smoking and since motivation is an essential element in harmful behavioral change, it can be assumed that people are more likely to believe that an external, new, and trendy method may induce change. E-cigarettes arouse considerable interest as a possible alternative to traditional tobacco cigarette smoking, but doubts about their impact on health, possible environmental pollution, and their commercial success without adequate regulation are attracting the attention of physicians, government agencies, and especially consumers. Many e-cigarettes are imported and in many cases manufacturing companies do specify neither chemical components of cartridges nor their amounts. Goniewicz et al. examined 16 different brands of e-cigarettes and found highly variable levels of nicotine (0.5–15.4 mg). In some cartridges, pharmacological substances were also found in addition to nicotine, including tadalafil, used in erectile dysfunction, and rimonabant, used as an anorectic drug until 2008. In addition, despite e-cigarettes do not produce combustion products, thus, the steam produced is free from toxic and carcinogenic substances found in tobacco cigarettes; they are not entirely safe. Actually, glycerin vapors have caused serious effects in the lungs, such as inflammation and wheezing, after a short period of e-cigarette use, probably due to inhalation of propylene glycol, which is a well-known powerful airway irritant. Bullen et al. recently investigated whether e-cigarettes had more effect than nicotine patches on smoking cessation in patients who had quit smoking for at least 6 months. Abstinence was higher in the nicotine e-cigarette group (7.3%) than in the nicotine patches group (5.8%) and in the placebo e-cigarette group (4.1%), so the authors concluded that e-cigarettes, with or without nicotine, were moderately effective in smoking cessation and that the main reasons for which smokers decided to use e-cigarettes were the perception of their lower toxicity compared to tobacco cigarettes; the need to reduce the risk of relapse and the possibility of smoking in places were tobacco smoking was prohibited. Therefore, there is no scientific support for the approval of these products since their long-term risks and benefits are yet to be identified although they do appear to help smokers unable to quit smoking to reduce their cigarette consumption. Despite the present results, the last ISS Doxa survey (2014) reported a considerable reduction in e-cigarette consumption in Italy from 4.2% in 2013 to 1.6% in 2014. The present results support those reported by the 2012 ISS Doxa survey  and that is that Italians quit smoking mainly because of health problems. Since the majority of smokers referred being the only smoker in their family, smoking habits seem to be easily influenced by relational models. It is worth noting that 40% of the present sample is not aware that oral cancer exists , and only 36% of patients were informed about oral cancer by oral health professionals. The first finding supports data reported in the international studies but is not in line with data of a large 2011 Italian survey  which reported that >90% of dental patients were informed about oral cancer, although the present study involved private patients rather than public ones. As opposed to the above-mentioned study which was biased toward patients with a high incidence of oral cancer in relatives (17%), it is possible that the poor knowledge of oral cancer in the present sample is related to the low oral cancer incidence in patient family history. Moreover, in the present study, almost all patients who had knowledge about oral cancer were informed by their dentist/hygienist, while in the previous Italian study, only 14% of patients were informed by their dentist. This is possibly due to a more prevention-oriented approach in cancer counseling in private dental offices compared to public facilities. No relationship was found between diabetes mellitus, cardiovascular disease, and smoking habits, although smokers tried to quit smoking mainly because of general health problems (44.95%). Although about 88% of patients claimed not to be affected by cardiovascular diseases and diabetes mellitus, about 42% of patients claimed taking medication including antihypertensive drugs, anticoagulants, antiplatelet agents, and beta-blockers (31 = 19.62%), which are mostly related to cardiovascular diseases. Among general health problems, tumors may be considered and they also may have prompted patients to quit smoking since 18 patients (11.59%) claimed having suffered from several types of tumors and 75 patients (47.47%) claimed having relatives who suffered from tumors. An important finding in the present study is that among patients in PST, ex-smokers brush their teeth more often than smokers probably because they have acquired a greater ability for taking care of themselves and they feel more responsible for their oral hygiene although further studies are needed to validate this finding. To the best of authors' knowledge, there are no data in the international literature concerning the different attitudes toward tooth brushing in patients treated for periodontitis in relation to their being smokers, nonsmokers, or ex-smokers probably because it is assumed that patients on PST brush their teeth at least 2–3 times a day. On the contrary, many studies investigated different tooth brushing behavior among smokers, nonsmokers, and ex-smokers in the general population., Bergström  found that in patients with regular dental attendance, smokers do not differ from nonsmokers with respect to oral hygiene level and to compliance with hygiene programs. In the study by Jindra et al., a different approach to oral hygiene was found between smokers and nonsmokers in that smokers brushed their teeth significantly less often than nonsmokers and ex-smokers. Actually, among the investigated sample, the majority of those who brushed their teeth 2–3 times a day were nonsmokers, ex-smokers, or occasional smokers, while regular smokers did so in only 78.2% of cases (P < 0.00l). As for the compliance to the SPT, Ramseier et al. investigated on how differently smokers, nonsmokers and ex-smokers attended the scheduled recall examinations. These authors found that smokers were less likely to return for SPT than nonsmokers or ex-smokers although this might be attributed to confounder factors such as age, gender, SPT intervals, and severity of periodontal disease. The present patient sample is not in line with the WHO guidelines for healthy adult diet as far as fruit and vegetable daily consumption is concerned, which is at least 400 g a day (five portions). Dental team counseling should therefore be specifically oriented in directing patients toward healthy eating habits. The present results are not in line with the PASSI Italian Health Report on fruit and vegetable consumption, which indicates that half of the Italian population eats three or more fruit/vegetable servings a day, but only 10% of them eat the recommended quantity. People consuming more fruit and vegetables mainly live in Northern Italy mainly include women, people over 60, and people with a higher educational level and without economic difficulties. According to the WHO Atlas More Details of heart diseases and stroke, a low fruit and vegetable consumption is responsible for about 31% of coronary heart disease and for about 11% of strokes worldwide. If every European citizen ate 600 g of fruits and vegetables/day, over 135,000 deaths a year due to cardiovascular disease would be avoided. A correct fruit and vegetable intake not only protects against cardiovascular, neoplastic, and respiratory diseases, as well as cataracts and constipation, but also ensures a significant intake of complex carbohydrates, nutrients, and antioxidants, and reduces the total caloric intake of each meal since these foods tend to make you feel full. The present study clearly deviates from the healthy lifestyles as far as sports activities are concerned since 37% of patients did not play sport. Dental teams should be promoters of a change in this unhealthy behavior. Actually, a lack of physical activity is identified worldwide as the 4th risk factor for mortality, and in many countries, the level of physical inactivity is increasing, with a major impact on the prevalence of noncommunicable disease as well as general health status of populations around the world. The present results do not differ from surveys regarding Italians  which report that only 33% have physically exerting jobs or perform physical activities at an active level, while 37% do not have physically challenging jobs or perform a low-level physical activity and 30% do not do any physical activity at all. A sedentary lifestyle is directly related to age and inversely related to educational level and economic conditions for both men and women. Sedentary lifestyles did not decline between 2008 and 2011, and there was a clear Northern-Southern gradient since the autonomous province of Bolzano presented a significant lower percentage of sedentary people (1/10), while Basilicata registered the highest one (5/10). Moreover, individual self-perception was an important feature of inactiveness since only 1/5 inactive people perceived his/her level of physical activity as being sufficient. Finally, 1/3 patients reported having been asked questions about physical activity by his/her doctor and having been recommended to exercise more. HPV is a sexually transmitted infection. Ninety percent of the sample was not vaccinated against HPV. This is partly due to the mean age of the sample (54 years) which is higher than the 12–45 age range in which HPV vaccination is presently recommended, and partly to the fact that, in Italy, until March 2014, HPV vaccination was recommended only for women  while the present sample is evenly distributed by gender. On the contrary, in other countries such as Australia, Canada, USA, and Northern Europe, HPV vaccination has been recommended for several years for both genders at the age of 12. Actually, oral mucosa is susceptible to HPV infection as well, and various HPV subtypes have been isolated from both benign and malignant lesions. Evidence of an association between HPV and head-and-neck cancers including oral cancer has been found worldwide. More than 100 different genotypes of human HPV are presently known and classified into high-risk genotypes (including HPV 16, 18, 31, 33), which are associated with potentially and highly malignant lesions and low-risk genotypes (including HPV 2, 4, 6, 11, 13, 32), which are most commonly associated with benign manifestations such as squamous papillomas and common and genital warts. Since the incidence of genital HPV infection in men is always high throughout their lives  and males seem to be more at risk (three times more) for oral cancer and HPV-related cancers are increasing worldwide, it appears necessary to increase prevention campaigns and information by both general and oral health professionals also toward males and vaccination should also be recommended to them as well. It is also possible that the low number of vaccinated patients of the present sample are related to the poor awareness of HPV as a risk factor for oral cancer as was found in other studies although this was not an aim of the present study. Half of the sample did not drink alcoholic beverages and ex-smokers drank less alcohol than the entire sample. These findings do not support those of the 2012 Italian National Institute of Statistics report, in which 66.9% of people aged over 14 years consumed at least one alcoholic drink during the last year and alcohol abuse was more frequent in smokers and ex-smokers than in nonsmokers. This is probably due to the present study sample which is biased toward more health-conscious patients. On the other hand, it is also possible that patients felt offended when asked about this particular aspect of their habits with an underestimation of its real entity,, so much so that in the study carried out in Scotland by Macpherson et al., only 3% of dental practitioners routinely asked patients about alcohol use, while the majority (68%) rarely or never did so since enquiring about alcohol use made them feel uncomfortable. It seems that awareness of patient in SPT about health risks related to smoking does not assume a change in their harmful behavior and that among oral health professionals, there is not yet a widespread awareness of the importance of their role in increasing the patient's motivation to quit. Nevertheless, dentists and dental hygienists, especially in periodontally oriented practice, meet with their patients more frequently than any other health workers; thus, they play an essential role not only in counseling patients and in supporting those who want to quit smoking but also in explaining the harmful effects of smoking to nonsmokers, especially younger ones, both on oral and systemic health grounds. The answer to these problems may be to establish a network of services that include different types of support for smoker dental patients as well as for the entire dental team: minimal advice to every patient, motivational reinforcement during all check-ups, informative brochures, smoke quitting telephone support, group treatments, referral to anti-smoking centers, and increasing training on motivational counseling for all oral health workers. Further studies with greater sample sizes might be useful in detecting if any variables are significant in relation to different Italian neighborhoods, cities, or regions. U.S. Department of Health and Human Services. The Health Consequences of Smoking: 50 Years of Progress. A Report of the Surgeon General. Atlanta, GA: U.S. Department of Health and Human Services, Centers for Disease Control and Prevention, National Center for Chronic Disease Prevention and Health Promotion, Office on Smoking and Health; 2014. Vigneswaran N, Tilashalski K, Rodu B, Cole P. Tobacco use and cancer. A reappraisal. Oral Surg Oral Med Oral Pathol Oral Radiol Endod 1995;80:178-82. Malhotra R, Kapoor A, Grover V, Kaushal S. Nicotine and periodontal tissues. J Indian Soc Periodontol 2010;14:72-9. Lund M, Lund KE, Rise J. Preventing tobacco use in Norwegian dental practice. 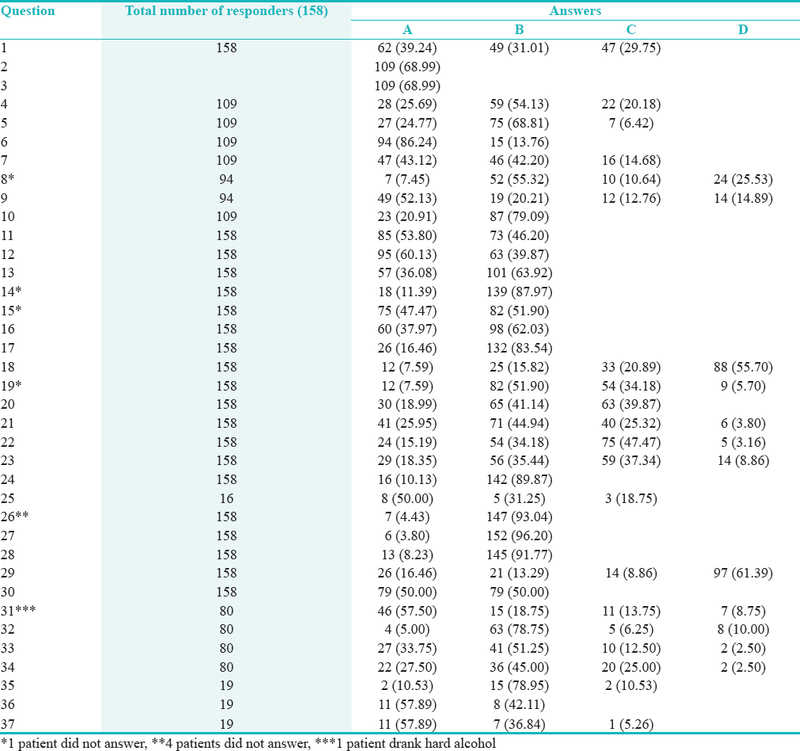 Community Dent Oral Epidemiol 2004;32:385-94. Johnson NW, Lowe JC, Warnakulasuriya KA. Tobacco cessation activities of UK dentists in primary care: Signs of improvement. Br Dent J 2006;200:85-9. Bergström J. Periodontitis and smoking: An evidence-based appraisal. J Evid Based Dent Pract 2006;6:33-41. Italian Institute of Health (ISS). Press release No. 9/2014; May 30, 2014. Available from: http://www.iss.it/binary/pres/cont/schedeFUMO.pdf. [Last accessed on 2015 April 01]. Gallus S, Lugo A, Colombo P, Pacifici R, La Vecchia C. Smoking prevalence in Italy 2011 and 2012, with a focus on hand-rolled cigarettes. Prev Med 2013;56:314-8. Osservatorio Su Fumo, Alcool e Droga (OSSFAD) – Indagine DOXA-ISS; 2014. Available from: http://www.salute.gov.it/imgs/C_17_notizie_1602_listaFile_itemName_0_file.pdf. [Last accessed on 2015 Apr 02]. Women against Lung Cancer in Europe. Stop Smoking. Available from: http://www.womenagainstlungcancer.eu/smetti-di-fumare/. [Last accessed on 2015 Apr 06]. Umberto Veronesi Foundation. Press Release. Milan, 6, November, 2013. Available from: https://www.fondazioneveronesi.it/tools-della-salute/come-smettere-di-fumare/addio-fumo-solo-se-maiuti. [Last accessed on 2015 Apr 01]. Bornstein MM, Frei M, Sendi P, Ramseier CA, Reichart PA. 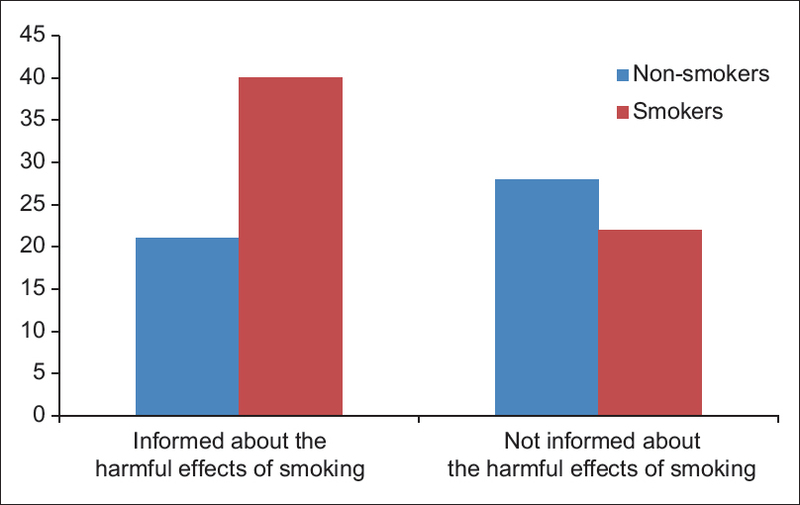 Patients' awareness of the potential benefit of smoking cessation. A study evaluating self-reported and clinical data from patients referred to an oral medicine unit. Clin Oral Investig 2012;16:55-62. Hassona Y, Scully C, Abu Ghosh M, Khoury Z, Jarrar S, Sawair F, et al. Mouth cancer awareness and beliefs among dental patients. Int Dent J 2015;65:15-21. Lung ZH, Kelleher MG, Porter RW, Gonzalez J, Lung RF. Poor patient awareness of the relationship between smoking and periodontal diseases. Br Dent J 2005;199:731-7. Gussy M, Newton JT, Palmer RM. The role of dental hygienists in the promotion of smoking cessation. Dent Health 1996;35:5-8. Dalia D, Palmer RM, Wilson RF. Management of smoking patients by specialist periodontists and hygienists in the United Kingdom. J Clin Periodontol 2007;34:416-22. Ramseier CA, Suvan JE. Behaviour change counselling for tobacco use cessation and promotion of healthy lifestyles: A systematic review. J Clin Periodontol 2015;42 Suppl 16:S47-58. Pakfetrat A, Falaki F, Esmaily HO, Shabestari S. Oral cancer knowledge among patients referred to Mashhad Dental School, Iran. Arch Iran Med 2010;13:543-8. Goniewicz ML, Kuma T, Gawron M, Knysak J, Kosmider L. Nicotine levels in electronic cigarettes. Nicotine Tob Res 2013;15:158-66. McRobbie H, Bullen C, Hartmann-Boyce J, Hajek P. Electronic cigarettes for smoking cessation and reduction. Cochrane Database Syst Rev 2014;12:CD010216. Osservatorio Fumo Alcol e Droga (OSSFAD)-Istituto Superiore di Sanità. Rapporto Sul Fumo in Italia; 2012. Available from: http://www.iss.it/binary/fumo/cont/Rapporto_annuale_sul_fumo_2012.pdf. [Last accessed on 2015 Apr 06]. Srikanth Reddy B, Doshi D, Padma Reddy M, Kulkarni S, Gaffar A, Ram Reddy V, et al. Oral cancer awareness and knowledge among dental patients in South India. J Craniomaxillofac Surg 2012;40:521-4. Luryi AL, Yarbrough WG, Niccolai LM, Roser S, Reed SG, Nathan CA, et al. Public awareness of head and neck cancers: A cross-sectional survey. JAMA Otolaryngol Head Neck Surg 2014;140:639-46. Bergström J. Oral hygiene compliance and gingivitis expression in cigarette smokers. Scand J Dent Res 1990;98:497-503. Jindra S, Vimal J, Lenka H, Zdenek F, Radovan S, Sajith V. The influence of smoking on dental and periodontal status. Oral Health Care - Pediatric, Research, Epidemiology and Clinical Practices. Virdi M, editor. ISBN: 978-953-51-0133-8, InTech; 2012. Available from: http://www.intechopen.com/books/oral-health-care-pediatric-research-epidemiology-and-clinical-practices/the-influence-of-smoking-on-dental-and-periodontal-status. Ramseier CA, Kobrehel S, Staub P, Sculean A, Lang NP, Salvi GE. Compliance of cigarette smokers with scheduled visits for supportive periodontal therapy. J Clin Periodontol 2014;41:473-80. World Health Organization. Healthy Diet. Fact Sheet No. 394. Available from: http://www.who.int/mediacentre/factsheets/fs394/en/. [Last accessed on 2015 April 2; Last updated on 2015 Jan]. Progressi Delle Aziende Sanitarie Per la Salute in Italia. Rapporto Nazionale Passi: Attività fisica; 2011. Available from: http://www.epicentro.iss.it/passi/rapporto2011/AttivitaFisica.asp. [Last accessed on 2015 Apr 06]. Bonanni P, Bechini A, Donato R, Capei R, Sacco C, Levi M, et al. Human papilloma virus vaccination: Impact and recommendations across the world. Ther Adv Vaccines 2015;3:3-12. Italian Ministry of Health. Vaccination against the Human Papillomavirus. See also Circular; 24 April, 2014. Available from: http://www.salute.gov.it/portale/salute/p1_5.jsp?id=31&area=Vaccinazioni. [Last accessed on 2015 Jun 06]. Zuccotti GV, Mameli C. L'infezione da HPV nel maschio. Riv Immunol Allergol Pediatr 2013;4:39-44. Castro TP, Bussoloti Filho I. Prevalence of human papillomavirus (HPV) in oral cavity and oropharynx. Braz J Otorhinolaryngol 2006;72:272-82. Kreimer AR, Clifford GM, Boyle P, Franceschi S. Human papillomavirus types in head and neck squamous cell carcinomas worldwide: A systematic review. Cancer Epidemiol Biomarkers Prev 2005;14:467-75. World Health Organization. Media Centre. Human Papillomavirus (HPV) and Cervical Cancer. Fact sheet No. 380. Reviewed March 2015. Available from: http://www.who.int/mediacentre/factsheets/fs380/en/. [Last accessed on 2015 Apr 06]. Giuliano AR, Lee JH, Fulp W, Villa LL, Lazcano E, Papenfuss MR, et al. Incidence and clearance of genital human papillomavirus infection in men (HIM): A cohort study. Lancet 2011;377:932-40. Marur S, D'Souza G, Westra WH, Forastiere AA. HPV-associated head and neck cancer: A virus-related cancer epidemic. Lancet Oncol 2010;11:781-9. Kram YA, Schmidt TH, Saghezchi S, Russell MD. Attitudes toward human papilloma virus vaccination and head and neck cancer prevention in a diverse, urban population. Otolaryngol Head Neck Surg 2015;153:538-43. Italian National Institute of Statistics (ISTAT). Press Release. Use and Abuse of Alcohol in Italy. Reference Period: Year 2011. Date of Publication: Wednesday, 11 April, 2012. Available from: http://www.istat.it/it/archivio/59033. [Last accessed on 2015 Apr 06].